From Algeria to Zimbabwe, Constitutions of the World is a guide to the constitutions and constitutional histories of eighty nations. It will prove an invaluable resource for any teacher or student interested in politics, law, human rights or the political history of nations across the world. Strucured alphabetically each chapter profiles one country in an easy-to-use format. For every country a wealth of information is to be found. 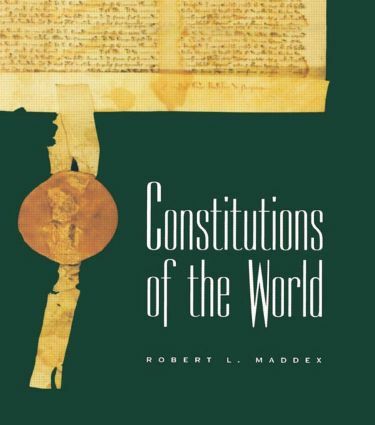 Robert L. Maddex, author of The Illustrated Dictionary of Constitutional Concepts is an attorney in Washington D.C. who specializes in international law. He has served as chief counsel of the Foreign Claims Settlement Commission of the United States and as an adviser on constitutional issues to several nations.